Do the webquest. Write the answers to the questions in your notebooks and don´t forget to leave a comment. A very interesting comment, Patricia. It is true that it might be a little long but I´m happy that you found it interestig.Thank you. Hi teacher! This exercise is very interesting. I studied the European Union in social science, but this is a resume. Thank teacher! Thank you for your comment,Mayte! I´m glad that the exercise has been useful to revise what you had already learnt in Social Science. Thank you, Lucía. I hope you enjoyed it!! Hello Teacher, these activities are interesting but the EU gave it the last quarter in sciencies social,although there are data that didn't know honestly. I´m happy that you learned things that you didn´t know about the EU. Thank you for your comment, Jose and see you tomorrow! Thank you, Desi. 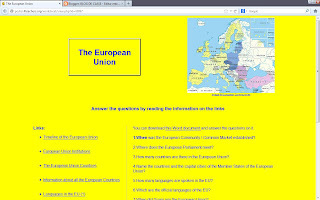 I also think that it´s good to learn new things about other countries and the institutions of the EU. I´m glad that you found it interesting. Bye and see you tomorrow! Hi, Kiko. I don´t agree with you. What you have done is a reading exercise IN English. English is a language and you use it to communicate.And in this case, you have read about the EU.We´ll talk about this in class, Bye!